Kurt Vonnegut’s legacy is celebrated daily in Indianapolis, where a small but mighty museum has collected artifacts of the author’s life and work. Here are some new things we learned about the writer during our visit. I’m touring the Kurt Vonnegut Memorial Library with its curator Chris Lafave, and he’s showing me a picture of a young, Army-era Kurt Vonnegut. Clean shaven, his signature ‘stache nowhere in sight. The Library, which opened in Indianapolis in 2011, houses items from all stages of Vonnegut’s life. Together the pieces tell the story of the boy from Indianapolis who would become one of America’s favorite authors. General Electric. His older brother Bernard, a scientist at GE, got him a job in the publishing department. The Library recreated Vonnegut’s studio in their space. The Library also houses Vonnegut’s typewriter, a Smith-Corona Coronamatic 2200. And there’s an unopened pack of Pall Mall cigarettes, which was lost behind the author’s book shelf at some point in the 1970s and discovered by his kids after his death. Other Vonnegut artifacts include his Alplaus N.Y., volunteer firefighter card, his Purple Heart (which he claimed to have won for “frostbite”), and a Nazi saber he brought home from WWII. Kurt gave letter grades to his books. He gave an A+ to “Cat’s Cradle” and “Mother Night,” but “Breakfast of Champions” only earned a C. “Slapstick” got a D.
One of the more intriguing items in the Library is an unopened letter sent by Vonnegut’s father to Kurt during WWII. No one knows why it was never opened. Explore the Library firsthand next time you find yourself in the Hoosier State. 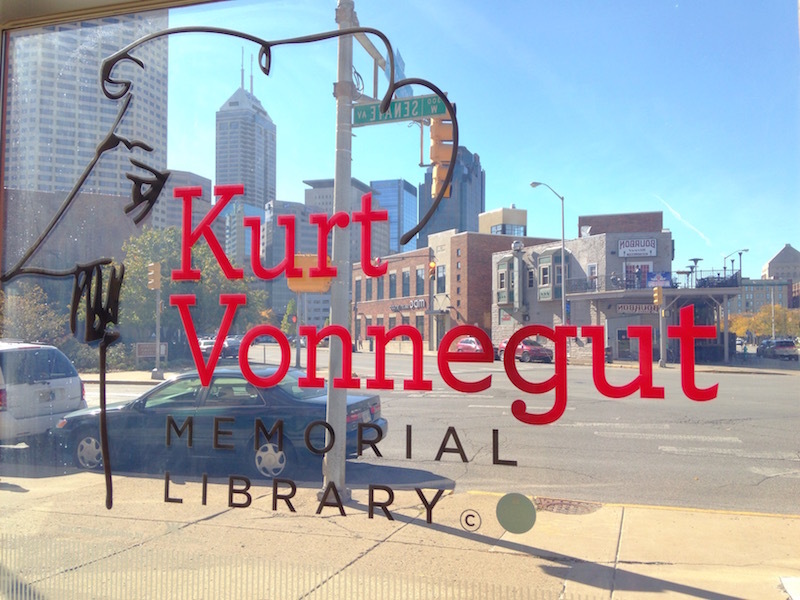 The Kurt Vonnegut Memorial Library is located at 340 N. Senate Avenue in Indianapolis.